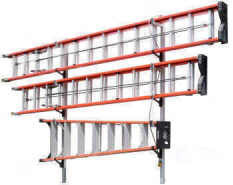 Industrial Wall Mount Ladder racks are engineered for strength. VertiRack's industrial wall mount ladder racks are supplied with solid or hollow wall mounting kits engineered to withstand the stress and strain of your industrial enviornment. Pre 2007 Sprinter Van Ladder Racks now available. Due to popular demand, VertiRack now offers owner's of pre 2007 model year Sprinter vans a more convnient and less costly ladder rack option. VertiRack Manufacturing Co. is now offering a pre 2007 mounting option for it's side mount Sprinter van ladder racks.